English Language Tutor – originally from London but now living and working in Norwich, UK. The #ELTchat which took place on 17 May 2017 was on a subject proposed by Twitter newcomer, @BrunwinLaura (All_things_TEFL), and selected from the suggestion rack by DJ moderator @SueAnnan. The topic question asked whether teachers forget to teach learning strategies to students, concentrating instead on just teaching the language?” This topic had been specifically dealt with only once before, in October 2011 – see this summary – although has probably featured in a number of other chats. @BrunwinLaura has been working as a DOS at a TEFL training centre in Madrid for the last four years. After using an imagery activity to help trainees to remember the different tenses, it made her wonder whether trainees leave such courses realising the importance of learning strategies. That same week she heard a conversation in a cafe that made her ponder our actions as teachers, so proposed this topic. She wrote about this balance between teaching English and the learning of English recently – here. Language learner strategies can be taught by teachers and/or acquired by the learners, but the question posed was whether we, as teachers, forget to (explicitly) teach them. Time Management was one issue, offered @angelos_bollas. Students can get overwhelmed actually by the amount of homework they have and need to show what to prioritise and try to allocate anticipated timings. @fionaljp said that maybe various strategies could be highlighted or exposed to students so that they can choose what works for them. @TheodoreLalos mentioned many strategies, such as ‘dual coding’ – relating concepts to words – and visuals (flashcards, mindmapping), which all came up later in the chat. @MoreMsJackson said one of her learning strategies is to get students to discover alternatives for homework. She asked her young learners to find five ways they could find definitions of a new word. As they initially suggested using the unreliable Google translate she asked them to find alternatives. IELTS is often more about teaching explicit strategies – especially for reading and listening – rather than language related, stated @eltplanning. @teacherphili agreed that focus is often about improving band score, while @happytojoinyou often applies IELTS reading strategies to improve reading efficiency. Objectives for exam and general English class would impact on strategies for learning and test-taking added @fionaljp. @BrunwinLaura believed that, as teachers, we spend much more time on teaching learning strategies for exam takers than with anything else. @eltplanning drums strategies into his learners for exam preperation, but can’t force them to apply it. @MoreMsJackson wondered how much crossover there is between learning strategies and (test-taking) strategies taught in exam prep courses? Also if it varies by skill. Getting a higher speaking band differs from general conversation skills, but reading might flex more. Motivation plays a part with conversation skills, said @eltplanning who added that he teaches more strategies for speaking in general English courses. @Marisa_C reminded everyone that learning strategies need to be consciously used to be called strategies. @teacherphili felt this is an important point. In the previous #eltchat on this topic someone did ask if they can be called ‘strategies’ if they’re unconscious. @teacherphili suggested that beyond brainstorming, the teacher could get the students to explore different strategies, but get them to model. However, @TheodoreLalos felt teachers should do the modeling using ‘Think-Alouds’. This is more of a demonstration and is different from brainstorming, which is eliciting ideas from the students. He uses the technique with his very young learners to understand blending and segmenting. @angelos_bollas does this with his exam prep students. He talks them through the thinking process when, for example, he has to do a multiple choice reading activity. For listening, @happytojoinyou often asks her learners to tell the class what strategies they used while doing the listening and we have a talk whose strategy is better. @SueAnnan always teaches how to improve listening, then set task for when out and about. @TeresaBestwick said that she encourages learners to be aware of errors, especially in writing with an error correction sheet. Hopefully they refer back to it next time. @islaflood thought that teaching a correction code at the beginning of courses can help learners more independently seek out mistakes and correct. As a TEFL trainer, @BrunwinLaura encourages trainees to use an error correction code when addressing writing to encourage self-correction strategies. @MoreMsJackson uses students as a resource, to peer share ideas for ways to take vocabulary notes such as pictures, definitions in English. Photo scavenger hunts are so much fun! added @ElleninEdmonton. @SueAnnan remarked that she is amazed that some of her students have no idea how to study, making long lists of new vocabulary, then doing nothing. @mr_harbottle remarked that while unfashionable, rote memorisation is a pretty good method for learning vocab, it works. @BrunwinLaura has always encouraged her students to connect vocabulary to images and stories to create mental links and aid retention. @happytojoinyou added that mnemonics can be really helpful for retaining some of the words. She recommended this technique and uses it herself. She also gives them texts for reading and asks them to pick out some vocabulary or grammar points they find useful, then explain these on the forum or in class. @SueAnnan asks her students to find out about the vocabulary they learn, such as active or passive need, register, collocations and put a few in sentences, otherwise they have whole lists of stuff they will never use again. @teacherphili said his 1-2-1 students have to use English every day so are fairly autonomous but don’t have any particular strategies for learning vocabulary. @BrunwinLaura agreed that in Spain the teacher is still generally seen as ‘giver of all information.’ More autonomous learning is needed. Many Spaniards have resigned themselves to the fact that they will ‘never get there’ after so many years of learning. @HeleneCombe said it’s the same thing in France. They just don’t know how to work alone. @angelos_bollas felt it was similar in Greece. One of @SueAnnan‘s students had a little box of cards he used for revision, which he moved to the back each week as he understood them. @HeleneCombe hoped the box wasn’t too big or he will begin to forget the ‘old’ words. @happytojoinyou said her students use Quizlet for the same purpose. @MoreMsJackson thought it was more suitable than Memrise, while @HeleneCombe said it is a good way to check their learning, interactive and fun. @islaflood added that Quizlet is great (for motivation). If you can get students hooked on the games they can compete and see themselves on a leaderboard. @kamilaofprague said that she has a class for each client and add sets myself. But she spoils her students so ‘can charge higher’. @Marisa_C welcomed this reminder, before commenting that good use of learning strategies leads to more successful autonomous learning during and after a course. Skills and strategies are often confused, too. A process oriented/focused teacher has learning strategies on the menu every day, she stressed. @BrunwinLaura said that doing so at the start of a course may also help to set learning strategies as an expectation for the duration of that course. @eltplanning felt it is a bit idealistic to spend at least one week’s worth of classes at the top of the course training students how to learn. You have to consider context – my learners might not see the value in such learner training. @Marisa_C Students usually intensely interested in self and how their self learns best in her experience. The teachers’ job is to stage manage this. @eltplanning disagreed, however. In his context, students are less willing to analyse their own learning experiences. It is unfair to force emphasis on teacher in that situation. He did admit that @Marisa_C‘s statement that process orientation is not a choice – the level of explicitness of how you do it is – was very true and asked for tips. Here is one that was offered. @seburnt mentioned one technique – screencasting. As he is reading through students’ writing, he gives oral feedback as he goes, talking through questions about their writing. @SueAnnan uses Snagit for screencasts. It makes the marking more personal and clears up any misunderstanding. But using it depends on how many students email you their homework. @happytojoinyou shows her choice of the best example of scanned writing on the screen and ask students to explain why. Another way for @seburnt is to show ones with particular problem areas and have them walk through with each other about what confuses them. He tries to get students to do it to each other’s writing, too. He increasingly demonstrates how he grades things and what he expects from a lesson. Not just a checklist, but a walk through of rationale. Why we are doing something often equates to buy-in, he stated. @happytojoinyou offered vocabulary mindmapping as one technique her students like, which reminded @seburnt of one way of prescribing note taking during reading or listening. Good to show a variety and have them choose. This is something that @ElleninEdmonton also did, when she teaches academic writing, along with list making. Students choose. She added that she likes to use some materials that focus on learning methods, for reading & listening. For speaking, @fionaljp encourages them to ask questions as part of critical thinking. Newcomer, @LEAPS_I_E_M, found that gesturing develops fluency. She has been implementing it for three years already and that is part of her daily practice. @ElleninEdmonton added one thing she does is keep a soft ball handy. When one student ends their speaking with ‘finished’, she starts throwing. NA convo style: pass! @islaflood asked what we thought about setting targets to encourage different learning strategies. Students can set their own goals too and the teacher just does occasional appraisals, replied @Marisa_C. @Marisa_C stated that not enough time gets spent on failure and why it happens. @TheodoreLalos replied that there are many inspirational videos available related to failure and how to overcome the fear of failure such as this! @Marisa_C agreed – in relation to wrong use of strategies, for example, memorising a long bilingual list may or may not be a good strategy. One alternative offered by @TheodoreLalos was that of ‘dual coding’ – relating meaning to visual cues? Instead of rote repetition to get those words to stick around, students can keep a journal, jot down the new words and write marker sentences. @WarwickLanguage chipped in with a late reply to the concept of failure. Modern Foreign Languages seem to focus on little else, while there tends to be a focus on the negative in Computer mediated communication. @Marisa_C concluded that students need to know more about the nature of language learning to appreciate strategies, training, for example, how do people read and how should we go about it? @TheodoreLalos couldn’t agree more. They also need to compare and contrast the different strategies that they have used. @SueAnnan commented that each student will learn differently, so finding out what works for them is often the key. There wasn’t much in the slow-burn this time, with just @ElleninEdmonton adding her comments. Nonetheless, this was a lively discussion, with many contributions from 21 different people. It built upon the chat from October 2011 and provided some up to date opinions. 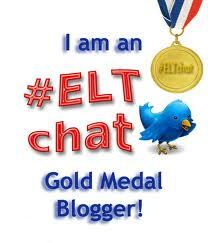 #ELTchat will meet again on Wednesday at 7pm BST. Blog post by Laura Brunwin about ‘The balance between teaching English and teaching the learning of English’ that she wrote before this chat took place. (1) Cohen, Andrew (2011). Strategies in learning and using a second language (2nd ed.). Longman. (2) Oxford, Rebecca (1990). Language Learning Strategies: What Every Teacher Should Know. NY: Newbury House Publisher. I create content for and do promotional work for this site. Are you looking for a free online English course for elementary students? We offer a free online course with various topics. Our site also provides plenty of free material for teachers and students of ESL, EFL and ESOL, including: podcasts, video lessons, infographics, idiom of the day, and games. Book English courses with a professional native speaker.